The monitoring of horses in training and longer post-ride recovery periods were among drastic proposals targeting the horse welfare crisis in endurance discussed at a seminar in Abu Dhabi. The seminar came days before the annual General Assembly of the International Equestrian Federation in Montreux, Switzerland, from Nov 5-7. The poster surfaced on the Normandy WEG Facebook page and vanished shortly thereafter… but not before Endurance Belgium captured it via a screenshot. The screenshot, taken Friday afternoon (if you click on this link to the page it no longer works). Seems pretty innocuous, right? But, as reported by The Daily Telegraph, the poster was “hastily pulled” when people began noticing that the front-and-center rider was Ali Al Muhairi, an United Arab Emerates endurance competitor who is currently serving a record four-year ban for doping. So... kind of like featuring Lance Armstrong on a poster for the Tour de France. Concerns that equestrian bodies are not reacting fast enough to public outcry about horse welfare in the sport of endurance racing have heightened. It emerged on Monday that the International Equestrian Federation had only recently inquired about two United Arab Emirates fatalities from the summer, and that a rider twice banned for doping featured in promotional material for the World Equestrian Games. The FEI’s slow response to the euthanasia of Eclipse and Django de Vere in July and August has raged on endurance forums for months. Both are registered as owned by the Maktoum family’s Fazaa stables and were ridden by Saeed Ahmed Jaber Al Harbi, who, though only 16, is already the world No 6-ranked rider. An endurance rider from the United Arab Emirates has received a two-year ban from the FEI for a doping infraction, adding another case to the Middle East’s sorry record of endurance drug breaches in recent years. A 16-year-old from Eccleshall has become the youngest rider to win the 100-mile Red Dargon endurance ride. The event is Wales’ toughest challenge and attracts hundreds of riders from all over Britain for the three day festival. Newtown St Boswells’ Nicky Bertham has completed her first year as Chef d’Equipe of the Scottish endurance horse riding team. The team manager moved into the role after several years as a team selector for the sport which sees horses, monitored regularly by vets, and riders cover distances of up to 160km. The Scots were second in the Home International earlier this year, beaten by Ireland by minutes, and fourth in the Celtic Challenge after one of the team’s high-mileage horses (now recovered) was ‘vetted’ out. The Scottish riders also won the best turned-out award. Attempts by the United Arab Emirates to show it is combating doping in endurance racing have suffered a major setback with news that Mohammed Ali Al Shafar has been banned for two years after the horse he rode to win one of the most prestigious races in the Gulf had been given banned steroids. Al Shafar’s horse, Orman de Cardonne, tested positive for the prohibited substance 17-alpha-hydroxyprogesterone hexanoate after winning the 100-mile UAE Presidents Cup in Abu Dhabi on Feb 16. It is the 34th doping case from a prominent UAE stable heard by the tribunal of the sport’s governing body, the FEI, since 2005, although a first from Al Shafar’s Al Reeh Stables in Dubai. Pierre Arnould, the Belgian national coach and a member of the FEI endurance committee, has spoken out about his sport’s doping scandals and the rising number of deaths in horses taking part. According to Arnould, dozens of horses died during the 2011-2012 season in the Middle East. Further to this, a total of 33 FEI tribunal hearings concerned the doping of endurance horses from the United Arab Emirates (UAE). More than 20 of those were trained at stables owned by Sheikh Mohammed, the ruler of Dubai, and other members of his family. Qatar and Bahrain have also been implicated in doping. It is hard to nail down the official number of equine deaths in the 2011-12 endurance racing season, but unofficial estimates suggest around 80. That means there were probably more. The International Equestrian Federation (FEI) recorded nine deaths in international events alone in the Group VII area that embraces the Middle East and North Africa. The following season, 13 horses died in Group VII international competition. There are nine regions that hold endurance races worldwide, so the general pattern is a worrying one. And these figures govern international, not domestic events, remember. The FEI’s statistics are limited. Horses that are put down as a result of injuries after returning home are rarely included in the figures, meaning the FEI is reliant only on information from national organisations at events. The statistics would be troubling enough without national bodies choosing to volunteer further bad news. Hipsters from the world’s national equestrian federations, about to pack their bags and head for Montreux for the FEI General Assembly, will no doubt be disappointed to have missed the Swiss town’s annual Freddie Mercury Memorial Day. Montreux celebrates the late and great lead singer of British rock band Queen in the first week in September, with fans flocking to the shores of Lake Geneva to take part in festivities and admire the three-metre tall statue of Mercury on the waterfront. FEI president Princess Haya has moved to assure national federations that the world governing body is working hard to sort out the problems within the sport of endurance. A prominent Italian horse welfare charity is continuing to demand an official investigation into the death of UAE horse after an international endurance ride in Sardinia — despite being ignored by Italian authorities. Django De Vere was rushed to a veterinary hospital, where he died after finishing 3rd in the 120km “Endurance Lifestyle” ride on the island of Sardinia on 31 August. Sonny Richichi of the mainland-based Italian Horse Protection Association (IHP) demanded the provincial public prosecutor seize the body for post mortem, and that the Italian equestrian federation (FISE) investigate. Richichi says both bodies ignored his repeated requests. Richichi was concerned about Django’s extreme heart rates — recorded as returning to normal in 37 and 52 secs respectively at the first two vet-gates but taking 30 minutes, significantly longer than any other horse, at the last. FEI president Princess Haya has moved to assure national federations that the world governing body of equestrianism is working hard to sort out the problems in endurance. Haya was commenting following Telegraph Sport’s interview with Belgian national coach, Pierre Arnould who feared endurance would be banned by a higher authority if doping and welfare concerns in the Middle East are not addressed. Arnould is a member of the FEI endurance committee and had earlier been chastised by FEI secretary general Ingmar de Vos for speaking to the media without having first consulted FEI colleagues. De Vos accused Arnould of bring the sport into “disrepute”, even though Arnould’s remarks were summarising issues widely reported worldwide for the past six months. Princess Haya wrote a personal note to the FEI’s 130 member national federations, setting out what the FEI had aimed to achieve while stressing it cannot react as quickly as the media. FEI Secretary General rebelled against the words of Pierre Arnould . We are delighted to see the rapid response (less than 24 h) indicating that the FEI can react quickly when it wants. We are not surprised that the secretary general protests formally and not versus the content , because it can not in his position do much better. He could still have been, being a bit courageous and forgetting the politically correctness, higlighting the tension taking place inside the endurance committee. He could have taken the opportunity to present some concrete actions in place of the well-known and obsolete speeches. But nope, he just speaks about the betrayal of somebody who apparently signed a non disclosure convention (ndlr: this doesn’t seem to really be the case). Should we be surprised or disappointed by this reaction ? The interview of Pierre Arnould has already reached its goal, position Arnould as the one who dares to loudly speak and stands against! The Belgian Federation supports his action and probably in the near future, others will follow. Will the FEI do like others did when quickly condemn Manning, Snowden, Assange to circumvent the problem without tackling it REALLY? It is for sure that this protesting communiqué can not be a satisfactorily answer. That the world of equestrians expects more. BERWICK The Seaway Valley Arabian Horse Association held their 2nd Annual Stormont Endurance Race along trails in the Berwick Forest on Aug. 31 and Sept. 1. The world class competition attracted over 65 participant, some from as far away as California and Ireland. FEI, thru the voice of its Secretary General Ingmar de Vos has immediately reacted on what has been said by Pierre Arnould to The Telegraph. The communiqué is displayed on their website. By doing that, FEI shows once again its incapacity of tackling the problem and acting quickly and effectively, without protecting this or that group. So it is Pierre Arnould who is guilty of reporting the system and of speaking publicly because he thinks it is his duty as member of this FEI endurance committee to work on the welfare of his discipline. In its high level speech about “Clean Sport”, FEI claims all the time they are working for the horse welfare and don’t want seeing any horse entering an event helped by forbidden medication. But… What did FEI up to now to tackle the problem with concrete actions? Despite having been warned by several federation –and not the least ones- Belgium, Netherlands, Switzerland, France since many months now. Why each horse fatality taking place on an event or the day after –and duly known by the endurance community- is not the subject of an investigation? Why –if those investigations have taken place- are the results not transmitted to the FEI Tribunal like it is the case with doping cases? Why are riders who have repeatedly killed horses not pursued? Who is aware of the reason of the horse death at Florac, horse ridden by a rider from Qatar? Which products have been discovered in the port-mortem? Where are the reports and the punishment? What about this horse collapsing and dying in Sardinia-Italy recently? The same rider was also riding Eclipse at Tarbes and leading him to euthanasia. From our sources, we can claim that the Belgian Federation is giving full support to Pierre Arnould and will shortly decides which actions to be taken. It is also now clear that Pierre Arnould is not alone fighting. Several European figures are also nauseous and want this to stop and our sport recovers its nobility. FEI didn’t like the Toulouse Group which was led by the late Pierre Cazes. Will this group revive thanks to another Pierre? In any case we are behind him and all men and women of good will are welcome. Send an email to endurance.belgium@gmail.com. Are we the only website devoted to endurance which dare to publish on the subject ? Are the others with their head in the sand so they don’t want seeing what happens? ....Belgian endurance official Pierre Arnould has leaned forward from the precision ranks of the FEI and, if I may continue the school theme a little longer, received a caning from FEI secretary general Ingmar de Vos for his trouble. International Equestrian Federation (FEI) secretary general Ingmar De Vos has denounced remarks by Belgian national coach Pierre Arnould, made in an interview with Telegraph Sport on Tuesday, that endurance riding could become a banned sport if the FEI cannot end the escalating crisis about doping and horse welfare issues in the Middle East. Mr De Vos said that Arnould, a member of the FEI endurance committee, had made "unsubstantiated allegations" without first consulting his FEI colleagues. "As an individual Pierre Arnould can speak his mind, but he cannot speak on behalf of an FEI committee without consulting its chair and his fellow members," said De Vos. "This is not just a legal issue. His actions show a total lack of respect. Mr Arnould is in clear breach of this signed agreement and his behaviour is totally unacceptable. "I am currently looking into whether any further action needs to be undertaken..."
FEI Secretary General Ingmar De Vos has today reacted to Endurance Committee member Pierre Arnould’s public statement on Endurance. Mr Arnould has made unsubstantiated allegations about the sport and, in so doing, has brought the sport and the FEI into disrepute. Mr Arnould has stated publicly that the FEI Bureau has rejected proposals put forward by the Endurance Committee. This is absolutely untrue. Mr Arnould spoke as a Member of the FEI Endurance Committee without either mandate or consultation. The Chair of the Committee has written to Mr Arnould on this issue. Like all FEI Committee Members, Mr Arnould signed a non-disclosure document and a declaration agreeing to support and actively endorse FEI policies. As an individual Pierre Arnould can speak his mind, but he cannot speak on behalf of an FEI Committee without consulting its Chair and his fellow Members. This is not just a legal issue. His actions show a total lack of respect for his colleagues on the Committee, but also for other volunteers within our organisation. Mr Arnould is in clear breach of this signed agreement and his behaviour is totally unacceptable. In my capacity as FEI Secretary General, and in consultation with the relevant bodies within the organisation, I am currently looking into whether any further action needs to be undertaken. In response to Mr Arnould’s statement, I state categorically that the FEI is working to address the issues in Endurance and has been for some time. Additionally, in 2012 the FEI undertook a full review of the Endurance rules, including a full Endurance session at the Sports Forum, in order to address the issues that arose from the strong growth of this discipline. These efforts continued in 2013. With the organisation of a round table session, the creation of the ESPG and the start of an Injuries Surveillance Study, the FEI is clearly fully committed to safeguard the further development of this discipline. Endurance racing could become extinct if the world governing body of equestrianism cannot solve the horse welfare crisis in the Middle East, according to a senior figure in the sport. Pierre Arnould, Belgian national coach and a member of the International Equestrian Federation’s (FEI) endurance committee, believes the FEI is not coping with the doping scandal afflicting the second horse sport in which Sheikh Mohammed is the major global player. Aside from doping, stress fractures in the high speed form of endurance racing favoured in the Middle East are an escalating concern. Arnould says dozens of horses died in or after competitions during the 2011-2012 Middle East season. Endurance is the FEI’s fastest-growing discipline but received little media attention until the parallel scandal at Sheikh Mohammed’s Godolphin racing stables in April. UAE endurance horses figure in 33 FEI Tribunal doping hearings, with more than 20 trained at stables owned by the ruler of Dubai and other members of the Maktoum family. Arnould and others have attempted solutions from within in recent years. He says the FEI endurance committee – specialist senior riders, judges, trainers and vets – agreed “drastic” measures with FEI secretary-general Ingmar de Vos in June which included tougher penalties covering horse-owners, federations and officials as well as riders and trainers, and lifetime bans; and the “creation of an incorruptible committee to observe the behaviour of officials”. THE Cornish Endurance team stormed to victory in the Celtic Challenge at the two-day Ridgeway Barbury Castle Ride in Wiltshire. Holding off a strong challenge from Ireland, Wales and Scotland, Cornwall posted their first ever win in this hotly contested competition. "It was a real team effort," said Veryan Barnaby, Chairman of Endurance GB South West. "Crews and spare riders all helped to ensure that everyone completed their ride and successfully passed the final vetting. We were thrilled to bits to win." France was guest of honour at CSIO Barcelona from 26-29 September for two reasons. First came victory for the "blue jackets" in the final of the Nations Cup, then the Normandy 2014 Organising Committee promoted the Games by holding a press conference for the international media and a field-based promotional operation to reach Catalonia’s horse-riding enthusiasts! The French national team - comprised of Simon Delestre, Patrice Delaveau, Eugénie Angot, Aymeric De Ponnat and Pénélope Leprévost, and led by Philippe Guerdat – dazzled by winning the new-look Nations Cup series, beating Brazil by just one point! The level of competition was very high, since among the other 7 nations present were Great Britain, reigning Olympic and European Champions; the Netherlands, who have already won two Cups this season; Canada, including multi medal-winner Eric Lamaze; and Brazil, winners of the qualifying competition. Two days earlier, Normandy native Patrice Delaveau triumphed in the Longines Cup, the most important individual class at CSIO Barcelona, on Carinjo Hdc. All in all, it was a great performance by the French team just under a year before the Games begin! The Endurance is horrible because of doping-like practices continue in the headlines. For Princess Haya, President of the International Equestrian Federation, a huge burden. Because her husband is brought into connection. Etti Plesch, born Countess Maria Wurmbrand-Stuppach 1914 in Vienna, had a penchant for fast horses and rich men. "Horses and Husbands" is the name for the biography published after her death in 2003, starting with the fact that the total of six times married woman twice the Prix de l'Arc de Triomphe won with the gallopers and Psidium Henbit, at a young age with An American millionaire's son was verkuppelt. Because the poor family only possessed the title of nobility. «Horses or spouse" according to the biography would be called, which could draw the Jordanian Princess Haya bint al-Hussein one day once. For the life of the President of the Fédération Equestre Internationale (FEI) her husband is becoming increasingly difficult to stressful mortgage. The 39-year-old Princess Haya is a second wife of Sheikh Mohammed bin Rashid al-Maktoum, the 64-year-old ruler of Dubai. This maintains one of the largest horse with Godolphin racing stables in the world, was hit in the spring of a big doping scandal. Full coverage anabolic steroids were administered as a control training in Newmarket (England) showed. Guilty as the trainer Mahmood al-Zarooni was branded, meanwhile, Sheikh Mohammed immediately cooperated with the authorities to close the affected stall left in his emirate of Dubai exacerbated the doping regulations. The damage was done, however, and the efforts to achieve a drug-free sport horses seemed hardly credible, because Sheikh Mohammed did not come out of the headlines. He himself was as endurance riders already closed due to doping, and in one of his English stables where horses are trained for endurance riding, in a raid in September 124 medical products were confiscated, which are not authorized in the UK for horses. An explosive Fund because the Endurance as opposed to horse racing, a discipline of the FEI, with the Princess Haya to act as the President for an ethical handling of horses and against doping. Of which her husband apparently seems not too much to keep. Efforts to ease term limits on the FEI peak at the beginning of November in Montreux upcoming General Assembly from 8 to 12 Years, Princess Haya recently declined with thanks. You will not be the end of their term of office end of 2014 continue to be available, they left with reference to their statements made to the office know. However, as they are likely to have influenced the recent events, especially the Swiss Equestrian Federation for months by the FEI and a workup of doping in endurance riding, the so-called Endurance calls. A FEI Commission has now established, but lack the independence, from the Swiss. Also complained that primarily improve the situation in the future, but not proven doping should be worked up. The latter is urgently needed because it seems like going to and fro in the chamber of horrors. The Swiss Association President Charles Trolliet, himself vet says that the FEI has tested positive between January 2010 and December 2012 at 41 international events horses in Endurance, primarily on steroids, anti-inflammatories and painkillers. The figures come from a statistic that has for the same period, 29 tested positive for jumping horses and states that 82.9 percent of cases in the Endurance rider from the Arab concern. "Le Monde" wrote a few days ago even of dead horses. The French association had three deaths at endurance events in 2012 registered. And over the sheet tells of a veterinarian that horses will injected intravenously vodka, enriched with the painkiller Sarapin, an extract of the pitcher plant, and toads or snake venom. What sounds like a horror story, might not be so far-fetched. Reported in the previous year, "New York Times" about similar practices in American horse racing. There were about 30 horses tested positive for dermorphin, which originates from South American frogs. The agent should numb pain, but also make the same hyperactive and thus be more effective than just pain-suppressing cobra venom. As FEI President still viable? If the situation continues to worsen and the horses empire of Sheikh Mohammed does not come out of the doping headlines, inevitably raises the question of whether his wife is even more portable than FEI President. Princess Haya is to finish the second term? A withdrawal before the end of next year would in the face of widespread outrage against the conditions in the Endurance hardly surprising. A premature withdrawal would certainly be a distressing line under a presidency that began so promisingly. Princess Haya, FEI transformed the antiquated in a modern global sports federation and brought a lot of character (Arabic) money. Achievements, currently stand in the shadows, throwing her husband about the equestrian sport. An illegal shipment of equine drugs seized at Stansted Airport from a private jet owned by the Dubai government consisted of more than 200 doses of 15 different medicines. Among them were injectables which should only be given by a vet and 100 doses of Tildren, a drug which encourages regeneration of bone tissue, and which if prescribed would only be given to a horse once or twice a year. The extraordinary haul of medicines, which are not licensed for use in the UK, was seized and destroyed by the UK Border Agency and the Veterinary Medicines Directorate in May. Sheikh Mohammed bin Rashid Al Maktoum, the ruler of Dubai and the most powerful figure in British racing, has opened an internal investi­gation into how the plane was discovered to be carrying an array of powerful medicines of a kind which are prohibited under anti-doping rules in the sport of endurance racing. The World Equestrian Games could be coming back to the Kentucky Horse Park in Lexington in 2018, the international committee that conducts the event announced Thursday. If chosen, the park would be the first two-time host for the quadrennial event that began in 1990 and includes eight equestrian world championships. The Federation Equestrian International announced Thursday that it has received interest from Great Britain, the USA and Canada to host the 2018 world championships. The two U.S. cities under consideration are Lexington, which hosted the 2010 games at the horse park, and Wellington, Fla., another equestrian competition center near Palm Beach. Dansawil Arabian Stud Endurance team, sponsored by Nutri Feeds Botswana, competed over the weekend of the 4th and 5th of October at the Stella Endurance Ride in North West province in South Africa. Endurance riding is the fastest growing equine sport in the world and Dansawil Arabians established in 1979 is one of the most experienced endurance Arabian Studs in Southern Africa. The Stella ride consisted of a 40km novice horse track on Friday and a competitive 80km track on Saturday. The Springbok Team riding time on this track is 04.02 hours. The track is one of the fastest in South Africa. The Dansawil Team consisted of two Batswana riders, Willie Herbst and Tebogo Mosorwa. The team was completed by Felicity Cooper and Louise Herbst as team manager and groom respectively. ABC's Nightline 10/08/2013, episode 210, features the Mongol Derby, the world's longest, toughest horse race. The International Equestrian Federation (FEI) is clamping down on unauthorised medicating of horses during competition as the crisis over doping and horse injuries in endurance racing deepens. Just three days after revealing the FEI is rolling out a new injuries surveillance system (ISS), Telegraph Sport has learnt the FEI is banning ammonium chloride – a substance primarily associated with controversial analgesic technique of “nerve-blocking” – and proposing to limit crew numbers so that horses cannot be concealed from officiating vets. The Swiss, Belgian and French equestrian federations were lobbying the FEI about “inequities” in Middle Eastern endurance before the drugs raids in May and August on properties owned by Sheikh Mohammed, the reigning endurance world champion and the most powerful owner in thoroughbred horseracing. The source of the illegal drugs is now being investigated on Sheikh Mohammed’s behalf by his wife, Princess Haya of Jordan, president of the FEI, and Lord Stevens’ intelligence company Quest. Endurance, which involves races up to 160km, is the only equestrian sport applying vet checks on the field of play during the event. Critics have cited the large size of “crews” – grooms and physios – employed by teams, sometimes as many as 12 per horse, for effectively obscuring it from view. The owner of the scandal-hit Godolphin stable has ordered a new investigation after banned equine drugs were discovered on a Dubai government private jet when it was searched at Stansted airport. Officers from the UK Border Agency, along with the Veterinary Medicines Directorate, seized the unlicensed products from a Dubai Royal Air Wing flight earlier this year, it has been reported. Sheikh Mohammed bin Rashid Al Maktoum, monarch of the gulf emirate, has now ordered his junior wife Her Highness Princess Haya, president of the International Federation for Equestrian Sports, to carry out an investigation into the incident. The FEI Endurance Strategic Planning Group (ESPG) held its second meeting this week as part of the ongoing process of strategic planning to meet the needs of the FEI’s second biggest discipline. The Group, which is chaired by Andrew Finding (GBR), spent a full day working on the development of a proposed strategic plan for Endurance that will address all of the challenges faced by the sport, and continued its work on the four key areas already identified that the Group believes require specific review to ensure that the discipline continues to grow in the correct direction - Governance and Structure; Culture and Responsibility; Communication; and Foundation for Growth. During the meeting, which was held at FEI Headquarters in Lausanne (SUI), ESPG members were also briefed by FEI Directors from the Veterinary and Endurance Departments on progress already made following the round table session in July, including the imminent implementation of the Injury Surveillance System, the ongoing management and assessment of FEI Endurance Officials, and Rule changes for approval at the GA.
“The issues are complex and wide ranging but the core challenge is to put in place a plan that will promote substantially reduced malpractice while ensuring the levels of supervision, management and regulation are right for a global sport. At its heart will be a call for cultural change, for good governance and self discipline”, ESPG Chair Andrew Finding said. The Group will hold a further in-person meeting prior to the dedicated Endurance session at the FEI General Assembly in November. The ESPG will then produce a detailed strategic plan for consultation early next year. The FEI Endurance Strategic Planning Group (ESPG) is chaired by Andrew Finding, European Equestrian Federation Board Member and CEO of the British Equestrian Federation. The members of the Group are veterinarian Brian Sheahan (AUS), chair of the FEI Endurance Committee; Joe Mattingley (USA), international Endurance rider; Saeed H Al Tayer (UAE), Vice President of the Dubai Equestrian Club and organiser of FEI World Endurance Championships; and veterinarian Jean-Louis Leclerc (FRA), an internationally respected and very successful chef d’équipe and team manager within the discipline. After its rebranding two years ago, the Sultan Mizan Cup 2013 has gained reputation as a world-class premier endurance event with past riders coming from France, Australia, Slovakia, Indonesia, Singapore and Thailand. Formerly known as the Sultan’s Cup Terengganu Endurance Challenge, which has been ongoing since 2007, the annual event is fast gaining interest from locals especially the younger generation who are interested in equestrian, recreational horse riding and endurance racing. The 120km race is held at the Terengganu International Endurance Park in Lembah Bidong in the district of Setiu, 50km north of Kuala Terengganu. Regarded as one of the world’s top notch endurance riding village, the park offers visitors and competitors the best of Malaysia’s hospitality. During the race, riders are expected to have an arduous journey through an oil palm plantation, along the coastline and canal banks as well as through forests to get to the finishing line. The last two races were won by Thailand’s Wipawan Pawitayalarp, who was also the first woman rider to win the Sultan Mizan Cup. The World Championships Young Horses held for the first time in our country ended last night with the closing ceremony and with the awards officialized by the FEI president Ian Williams. The World Champion title went to the French Aurelien Rocchia who rode Secret de mon Coeur. The second was the Spanish Silvia Yebra Altimiras, while the third was another French, Laurent Mosti. There has been a strong urge and desire to impress and to leave the mark in occasion of the first World Championships Young Horses held in Italy. The dream of the organizing Committee of Garda Endurance Cup, the company which hosted the sporting event at the feet of the picturesque castle in Valeggio sul Mincio, has largely come true. A leading equestrian federation has questioned the independence of a probe into Sheikh Mohammed's equine business. Former London police chief Lord Stevens was called in by the sheikh's wife to oversee an internal inquiry after illegal veterinary drugs were seized from a stables and private jet. Sheikh Mohammed is the world's biggest owner of racehorses, but the latest questions focus on endurance racing. The Swiss federation's Claude Nordmann would prefer an external investigation. The governing body of equestrian sport has pledged to introduce an injury surveillance system (ISS) this autumn in response to allegations that dozens of horses die each season while competing in Middle East endurance racing. Following lobbying from European federations, who have observed a link between endurance racing in the Middle East and stress fractures, the International Equestrian Federation (FEI) has decided to monitor injuries more closely. In Europe and North America, endurance racing is slower paced but the Middle Eastern sport often produces average speeds of 26kph on 160 kilometre (100 mile) championship tier rides. Last year, a study in the British Veterinary Journal highlighted injury-inducing averages of 35kph in the last 15-20km of the straighter, flatter desert tracks. Two recent seizures of unlicensed drugs – one in Newmarket in August and the other on a private jet at Stansted in May – were both linked to Sheikh Mohammed, the world’s ­leading racehorse owner and current endurance world champion. Sheikh Mohammed has opened himself up to further embarrassment following news that a former trainer who was banned for doping continues to work at Dubai stables owned by the Godolphin boss. Mubarak bin-Shafya was banned from endurance racing for two years in 2011 after several of his horses tested positive for stanozolol. However, that has not prevented him from training thoroughbreds from the Al Aasfa Stables, owned by the Sheikh, near Dubai City. And while there is no suggestion Sheikh Mohammed is involved in wrongdoing, the ongoing link with Bin Shafya, who is also a former colleague of disgraced Godolphin trainer Mahmood al-Zarooni, will cast yet further suspicion on the endurance horse operation. More than 20 endurance horses trained in Dubai at stables owned variously by Sheikh Mohammed and other senior members of the Maktoum family have been involved in doping cases since 2005. Further embarrassment has been heaped on Sheik Mohammed with confirmation that another horse trained at stables he owns has tested positive for a banned anabolic steroid. The Federation for Equestrian Sport yesterday confirmed a hearing is pending after the discovery of 17-Hydroxyprogesterone Hexanoate — an anabolic steroid banned in male horses — in Orman De Cardonne. The 11-year-old, ridden by Mohammed Ali Al Shafar and trained at Al Reef stables, tested positive after winning the President of the UAE Endurance Cup in Abu Dhabi on February 16. The case is yet to be submitted to tribunal. French riders scooped the gold and bronze medals of the FEI 120km World Championship for Young Horses, Garda Endurance Cup at the Garda Lake, Italy on Saturday. Aurelien Rocchia, astride Secret De Mon Coeur crossed the finish line first, followed in by Yebra Al Timiras, representing Spain, aboard Espoir De Bozouls while Laurent Mosti, riding Doria De Jansavis claimed the bronze medal for the French contingent. Doria De Janasavis itself was also named the Best Condition Horse. Rocchia held on very strongly when he was attacked on the line by the Spanish rider to cover the distance in 6 hours, 10 minutes and 37 seconds at an average speed of 19. 427km/hr. 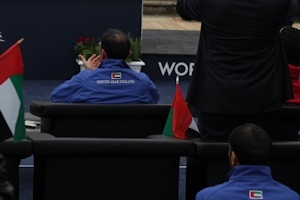 For the reputation of Sheik Mohammed – indeed the whole of Dubai - on the international stage of equine sport, suddenly the words damage limitation are starting to seem inadequate. The revelation that a consignment of unlicenced veterinary products was destroyed earlier this year after being seized on a Dubai government jet which had landed at Stansted airport thrusts the ruler of Dubai into an unwanted spotlight once again. The seizure of products one veterinary expert has described as ‘potentially toxic and dangerous to horses’ is connected to another find which emerged earlier this month at a farm near Newmarket which was part of the Sheik’s estate.